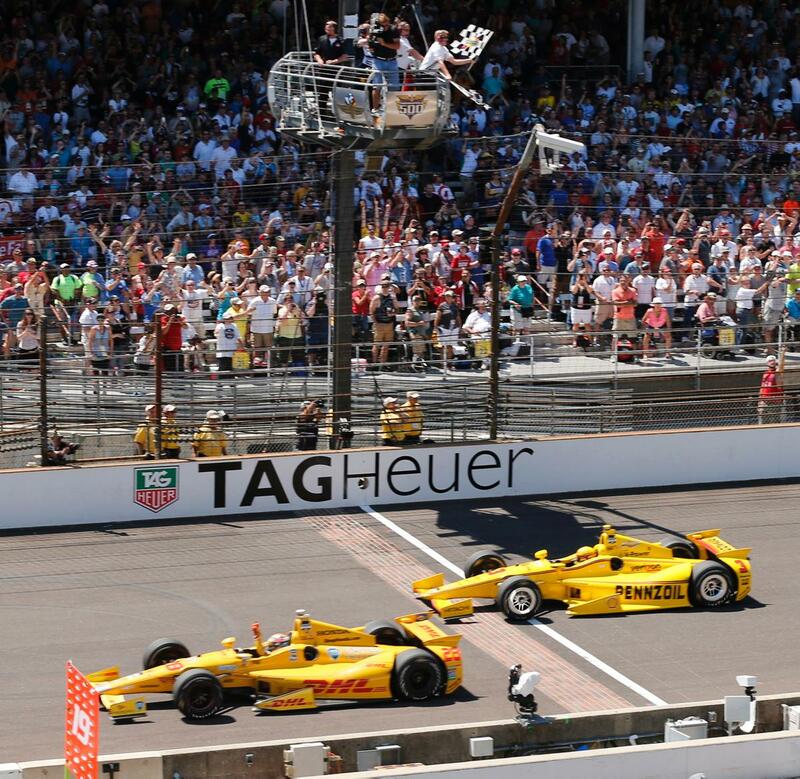 Thoroughly entertaining, last year’s Indianapolis 500 ran caution-free for the first three quarters of the race and featured an absolutely thrilling finish. American Ryan Hunter-Reay amazingly edged out Brazilian three-time winner Helio Castro Neves by less than a car length after passing him through the infield grass for the lead. The race was run with spec Dallara chassis, evolutionary cousin to the DW12. Before turning to this year’s 500, we have a serious question to ask. Now that the crown jewel of the sport the Indianapolis 500 has been adversely affected by aero kit madness, why not admit your mistake and go back to the pre aero kit Dallaras of last year, IndyCar? Practice for this year’s 500 turned out to be a disaster, especially for a number of Chevys which couldn’t manage to keep tires on the track instead getting airborne. The number of Chevys is three, in case you’re wondering. 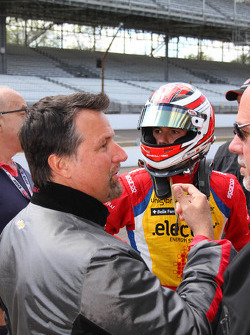 As a result the cars were slowed significantly, everyone was made safe and qualifications went off with a whimper, though there’s no denying the 500 was compromised by the last minute rules changes. Then Monday practice happened and things suddenly took a turn toward the injurious. 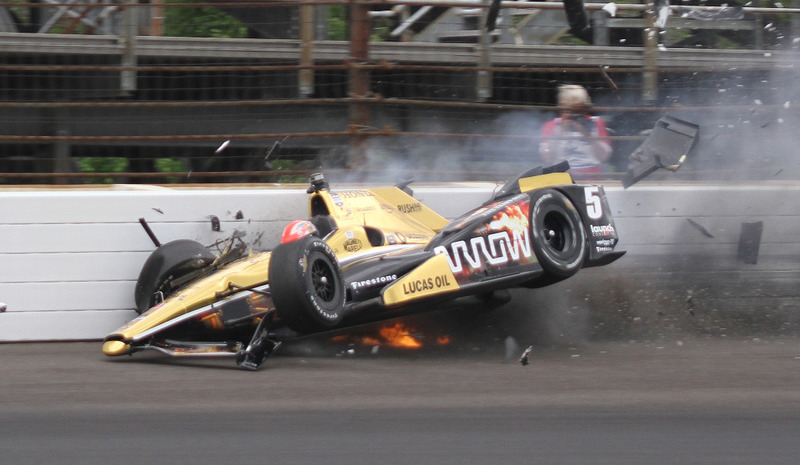 James Hinchcliffe’s Honda hit the wall in a hard impact, breaking the Canuck Mayor’s leg and eliminating him from the field (and rest of the season) in the painful process. 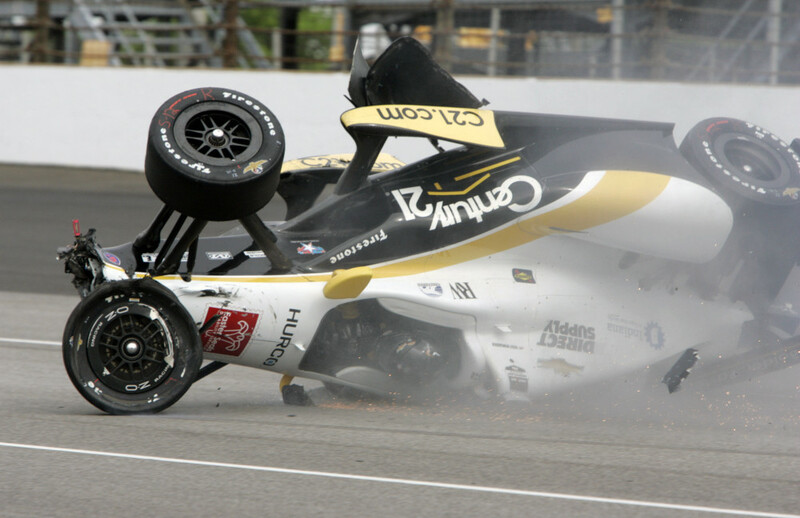 One driver down in the aero kit era at Indy, thirty two to go. Misleading Speeds: Andretti Autosport’s cat-like Colombian Carlos Munoz topped the speed charts at Indy this week with a lap of 230.1 miles per hour on Wednesday. It’s a misleading number, however. Without tows from other cars the speeds had been in the high 220s, compliments of Helio, Pags and Chevy’s special new aero pieces. 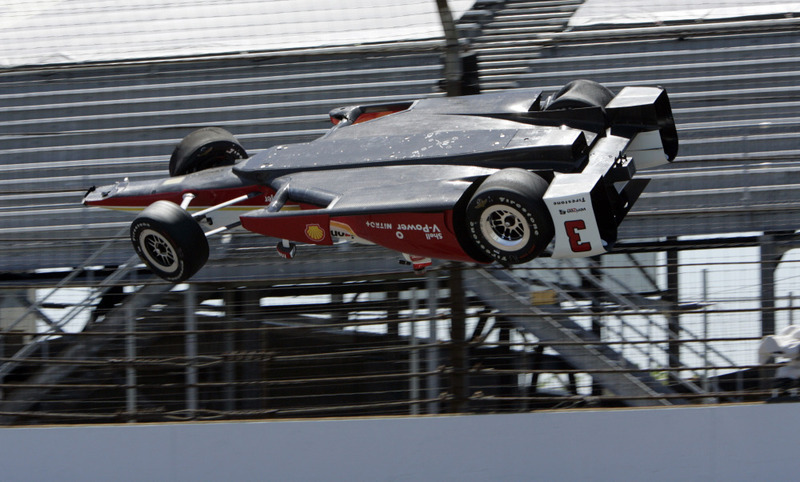 We stand by our prediction that there’ll be no new track records at Indianapolis this year, at least not in qualifying. Possibly in the number of back-flips by a car down the straightaway, though.